Is your home and heating system ready for the winter chill? Just like servicing your automobile, annual maintenance of your boiler or furnace can help keep it in tip-top shape, prolonging its lifespan and saving you money. Boiler/ Furnace tune-ups provide cleaner, more efficient operation and help ensure future problems are discovered before they occur. Annual maintenance of your boiler or furnace is vital to an efficient, worry-free heating season. At T.Webber Plumbing, Heating, Air & Electric we offer a Precision Heating Tune-Up to help keep your boiler or furnace running smoothly through the coldest nights. Whether your unit is oil or gas, our comprehensive service checks all facets of functionality; from inspecting your auto vents, relief valve, and thermocouple to cleaning the burner assembly and much, much more. Heating tune-ups make equipment run at or near original factory specifications, depending on the age and overall condition of the system. When heating equipment runs efficiently it doesn’t have to run as long to do the job, so you save a lot on utility bills. Potential problems, if caught early, can diminish the need for larger, costlier repairs. For example, cleaning a clogged oil filter is a relatively minor repair. However, if left untreated it can wreak havoc on your oil heating system and cause much larger problems. Let’s face it- break downs always happen at the worst times. Yet, with potential problems repaired and units running efficiently, there’s less chance of an inconvenient break-down during the coldest night of the winter. Properly maintained units don’t have to work as hard to heat your home. Less wear and tear on your unit, means a longer equipment lifespan. Ready to protect your system? Call T.Webber today. 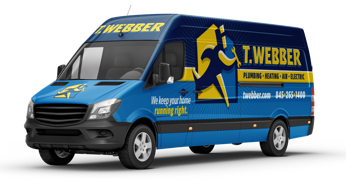 T.Webber Plumbing, Heating, Air & Electric has been providing expert heating service throughout the Hudson Valley since 1989. Our trusted technicians are licensed, highly trained, background checked, and drug tested. Call today to schedule service – and don’t forget to ask about the benefits of joining our Total Care Club for scheduled maintenance and additional savings.